Best Trekking Poles 2019 – Reviewed: Hiking is one of the best ways to explore your beautiful world. Lots of people in different parts of the world love trekking or hiking. Trekking poles are very much useful during trekking or hiking. There are a wide number of trekking poles available in the market. So, you may have a question, which should I buy? In order to resolve your issue here, we will provide the list of Best Trekking Poles for Hiking. Various serious hikers know the benefits of trekking poles. Apart from just offering stability while carrying a heavy load or crossing a technical terrain, trekking poles have a lot of benefits on easy trails. They are useful in setting a proper rhythm while covering long distances and also decreasing the impact on hips, knees, and ankles at the time of going downhill. Also, trekking poles enable a better hand and arm position for long hikes as well, thus increasing circulation in hands. In case you are recovering from injury or expecting to increase stamina via hiking, a great pair of hiking poles will make your journey wonderful. There are a lot of benefits of trekking poles. Similar to various other hiking and backpacking gear, balancing weight and durability is essential. Without much ado, here, we will provide you the list of Best Trekking Poles for Hiking in 2019. Black Diamond Alpine Carbon Cork poles are preferred first by the backpacking community for a long time. They are solid, 4-season poles which can be used in all the 4 seasons. The weight of these poles is around 8.5 ounces each and they are not lightest poles available in the market. They are damn light, but not ultralight, the strong design structure means that they are tough. Trekking poles consist of trekking baskets, powder baskets, interchangeable carbide tech tips, and an adjustable 360-degree padded strap. The grips are developed in a way that can be used for different purposes and is built from lightweight cork with an EVA grip extension beneath. The poles are made using the Flicklock Pro locking mechanism, the poles are fast, secure and easy to use. Also, this mechanism stops the poles from slipping under heavy use and the telescoping poles are built using 100% carbon fiber, thus making them lightweight and strong. The poles consist of the ability of moisture wicking, which is useful as your hands will sweat a lot. You will have a great fit in your hands even after hours of trekking. The price of these poles is high, which can be ignored based on the features it offers. 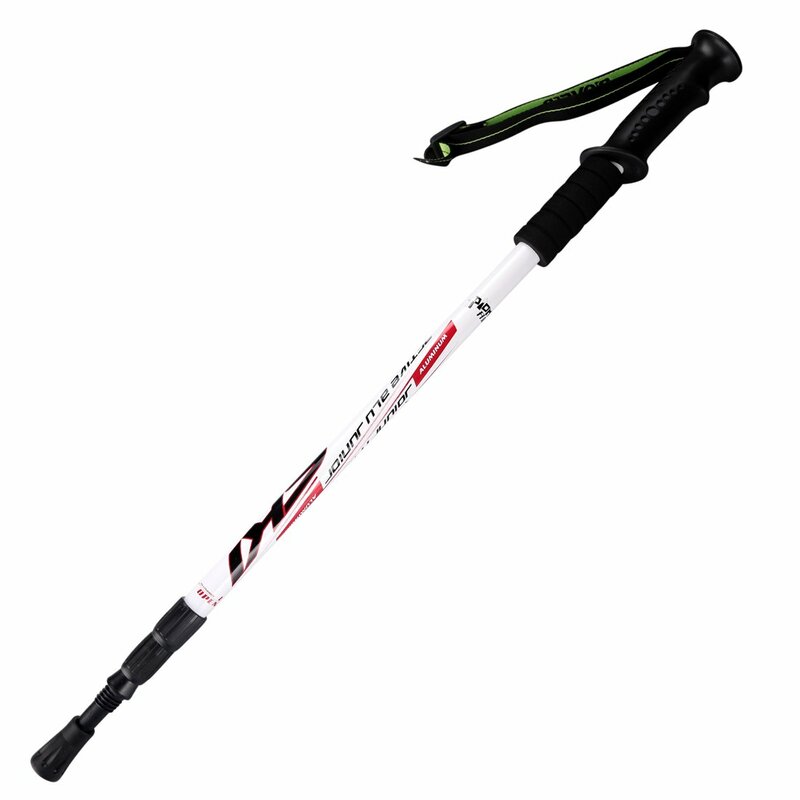 Leki is one of the most popular brands developing trekking poles. The firm is known for developing quality products and this trekking pole doesn’t disappoint. The shafts are built from carbon and so these poles are light and highly strong and these poles consist of a speed-lock feature for adjusting the length. In these poles, the grip is AERGON, a patented material which offers premium grip and dries very quickly. These poles are suitable for long hikes and pro hikers will get a wicking, comfortable foam grip. When the poles are folded, its size reduces to just 15 inches, hence you can carry them anywhere. The poles provide an option of adjustable length between 43 inches to 51 inches. The poles feature strong textured straps which makes sure that you never drop your trekking poles, they work well in long walks and rough or arduous terrain. These are premium poles, so they are expensive. However, these poles are worth the money. If you are a beginner or you don’t want to spend much on the trekking poles, then cascade mountain tech carbon fiber trekking poles is the best trekking poles available in the market. It is one of the least expensive trekking poles available in the market. It is lightweight and strong pole which is useful for hikers, walkers, backpackers, campers and others. The poles can be lengthened upto 38cm and they can be easily adjusted according to the trail you are hiking. Using this mechanism, you can easily adjust your pole height in trekking in the hill, flat terrain or a downward slope. Also, Carbon fiber structure keeps the poles lightweight around 442g per pair, which is great for such poles. The poles are built using EVA grip which offers a light, non-slip grip including an adjustable wrist strap. Bonus tip kit consists of snow basket, boots, and small rubber feet. 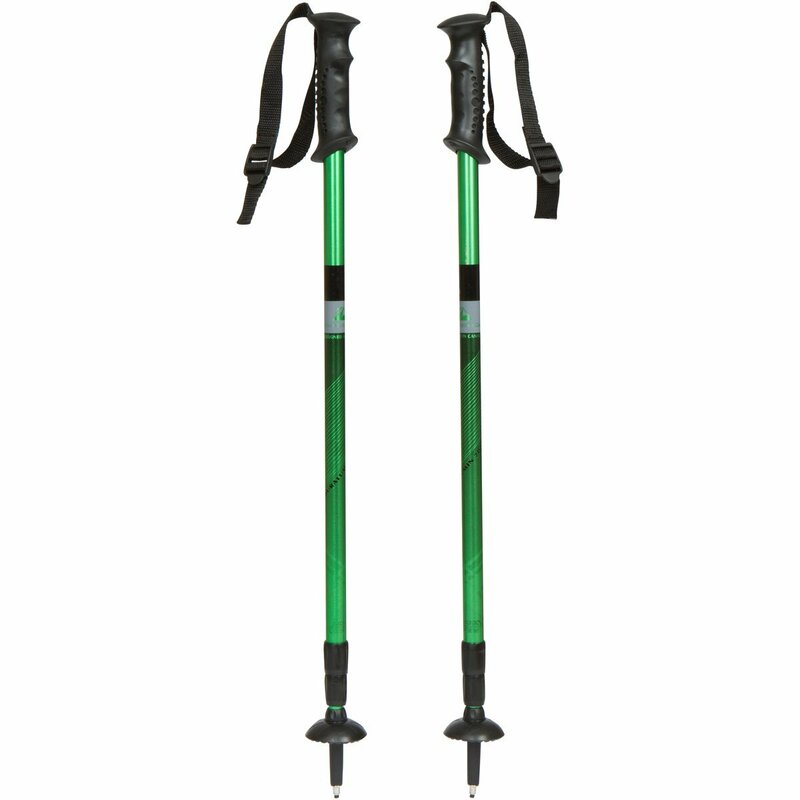 These poles are best suited for anyone who wanted to enjoy medium trekking and hiking. 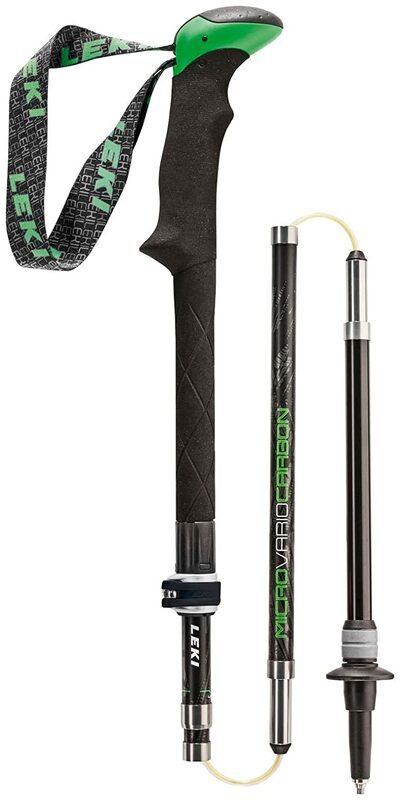 Currently, carbon fiber and folding designs are getting a lot of traction by people around the market due to innovations, however, hikers require appropriate pair of hiking sticks at a suitable price. If you want such poles, then go with Black Diamond Trail Ergo Cork. These poles fall under our list of Best Trekking Poles 2019. At just $130, the firm provides a great product with very few compromises. The poles are built from aluminum and its weight is just one ounce more than the premium Leki Micro Vario mentioned above. The poles are suitable for different dirt, rock and snow travel. The trail consists of Black Diamond’s convenient, ergonomically-shaped cork grips and trustworthy FlickLock length adjusters. When compared with Black Diamond Alpine Cork, here the shaft material is made from aluminum and not rubber. Various hikers think that rubber grips are not as comfortable as cork, they are right. Some hikers after getting used to corks experience chaffing and irritation while using rubber grips. If you are starting your hiking journey and looking for decent trekking poles, then you can surely go with Black Diamond Trail Ergo Poles. Montem recently entered into the recreational market and it is based in New York. Within a very short amount of time, the firm has become popular due to its amazing prices. Montem’s most popular model is Ultra Strong. Montem Ultra Strong poles are recommended for beginners. As we all know that Aluminum poles are heavier as compared to the carbon fibers, however due to this they are highly durable and strong. These poles are suitable for hiking on intense terrain or extreme environments. The poles are built from aluminum, level locks, and comfortable foam grips. The weight of these poles is 19.2 ounces, which is more as compared to other premium poles in the market. These are suitable for most day hikers and backpackers. Also, the height of these poles is just 24inch. The package consists of poles, storable rubber tips, pole connectors, and mud baskets. 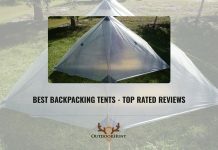 The two main drawbacks of the tent are, they are pretty heavy and made from lower quality materials. These poles are not suitable for difficult terrains. These poles come with a free lifetime warranty. 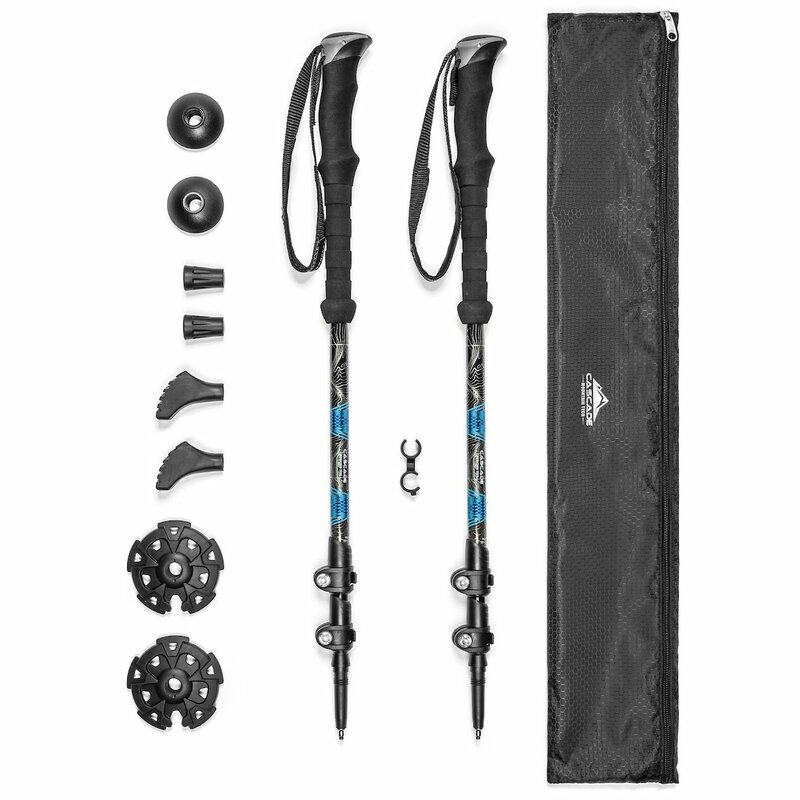 Distance Carbon Z Poles from Black Diamond are designed for long-distance treks and they are very light, strong and comfortable. The poles can be folded into a Z-pole design; hence their size reduces to a small size for convenient storage. Z-pole technology is the latest innovation in the trekking pole market and it has become popular due to its design. The poles fall under our list of Best Trekking Poles 2019. Here, the top quality trekking poles are available in four different sizes, which includes 100cm, 110cm, 120cm, and 130cm. Hence, you might get confused in selecting a pole of a proper size. Hikers who use trekking poles for shelter, as well as trekking, should purchase poles of appropriate size. By this, the poles will serve both the purposes. Here, all the trekking poles weight around 10 ounces per pair, thus making them the lightest trekking poles in the market. Hence, these poles are popular among the long-distance trail runners. The Distance Carbon Z poles are tough but not durable enough to handle extended snow travels. If you don’t have any issue of weight, then Black Diamond Distance Z poles are available in aluminum too. Apart from this, you can go with Black Diamond Alpine Carbon Cork for heavy trekking. If you are looking for trekking poles which you will use sometimes in a while, then BAFX Anti Shock Walking Poles are the best trekking poles in the market. Please note that these walking poles can’t be used for long-distance travels. Moreover, these poles are available at a reasonable price. These are a convenient set of poles with shafts built from aluminum for strength and weight-saving and they are completely extendable. The poles are strong and durable and make your hiking comfortable due to built-in anti-lock springs. The grips are made from rubber and consists of a padded wrist strap with ribbed grips so that you can hold hands on tough terrain. The poles weigh around 12 ounces, however, they are fully adjustable with a twist-lock system. Also, you can change the carbide tips or rubber tips or for baskets. The length of the pole increases from 26.5inches to 53iches. The poles are available with 1-year manufacturer warranty with all defects. 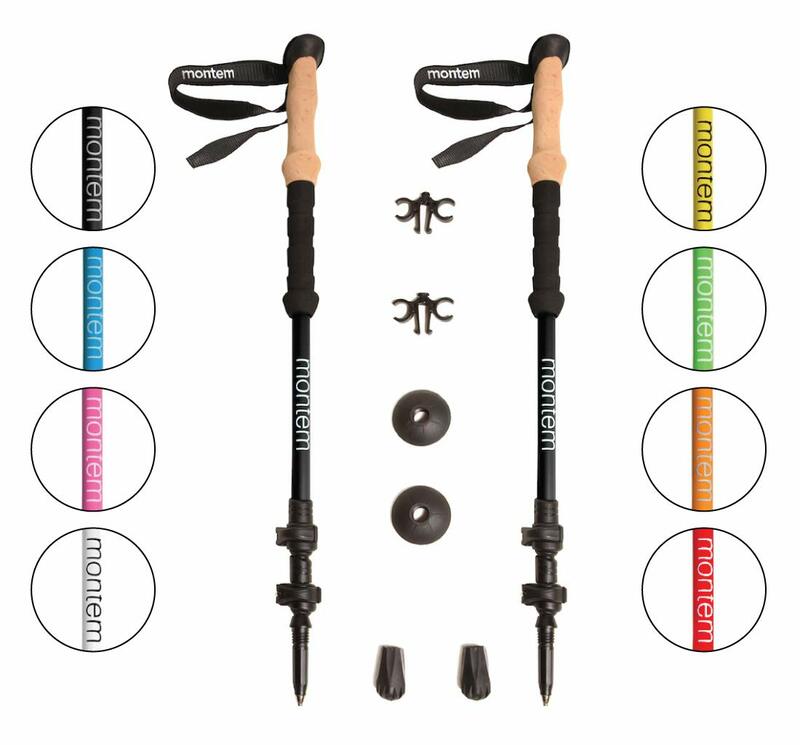 These trekking poles are designed to work in any terrain such as snow, hiking, mountaineering, or any other form of hiking. The poles are built from 100% carbon, hence these are the strongest and the lightest poles in the outdoor market. These poles are ultra-lightweight; the weight of each pole is around 7.6ounces. 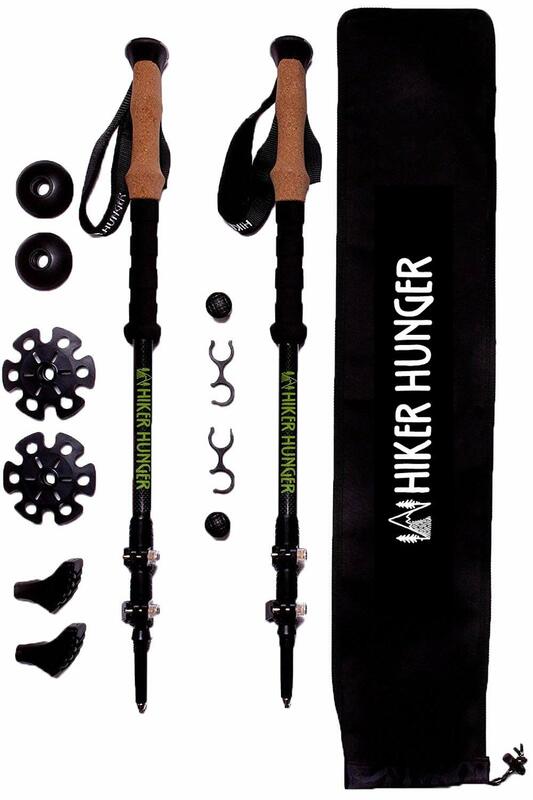 The hiker hunger poles are most popular in the market because of the legs of the camera tripods are typically sectional with each section sliding out to your suggested distance and then locking in place. The poles consist of a quick flip lock which allows you to extend or collapse your poles. The poles can be extended from 24inches to 54inches. Similarly, the poles can be collapsed to reach 21inches, which is small enough to be carried in a suitcase. The poles consist of rugged tungsten carbide tips with tip protectors and durable trekking baskets which provide stability and also retrains your poles from being lost in deep, soft ground. The poles feature a moisture-wicking ergonomic cork grip which gets into the shapes of your hand for maximum comfortability. Lastly, the poles come with a 1-year manufacturer warranty. 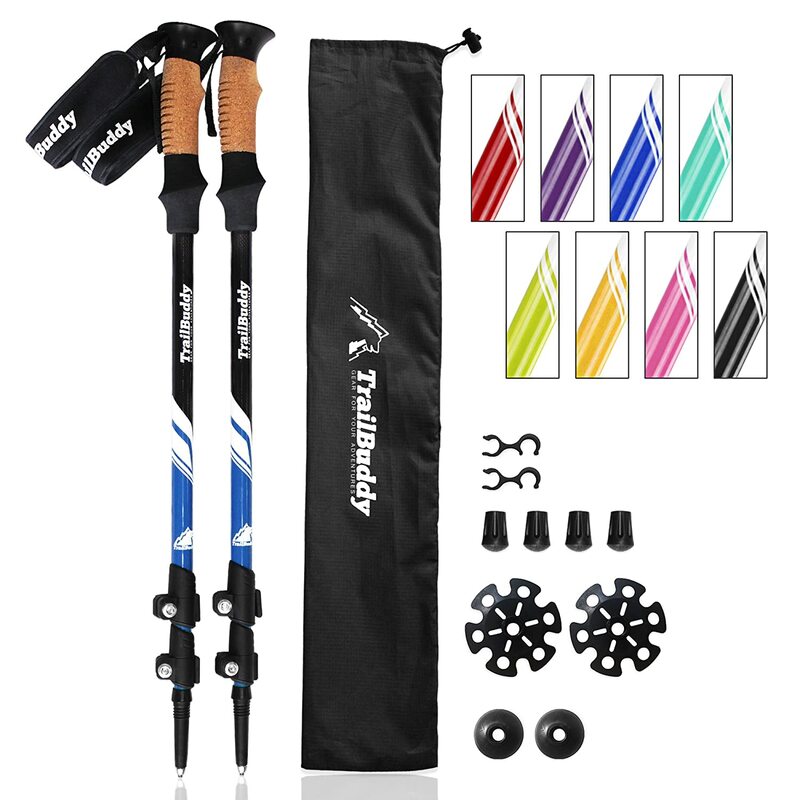 TrailBuddy Trekking poles are the best trekking poles available in the market with 4.8 ratings on Amazon. These Poles have a great strength to density ratio and are lightweight because they are made from 7075 aluminum. These trekking poles are extremely reliable. If you are hiking on rough terrain or carrying more weight, aluminum can withstand pressure and impact as compared to carbon fiber. As poles are built from 7075 aluminum, it weighs 4 ounces less, which will be beneficial if you are going to lift poles for thousands of miles in a single hike. At the time of wearing gloves or trekking in the rainy season, due to level-locks changing the height of poles from 24.5 to 54inches is quick and easy. Cork handles are comfortable to use in cold as well as hot weather conditions. Also, they can easily obtain the shape of your hand and the strap is padded to avoid chaffing your skin. The package consists of carrying bag, 2 pairs rubber tips, 1 pair of connectors, mud baskets and snow baskets. Thus, if you are a type of person who likes to enjoy long treks into the forest, then go with the Trail Buddy Trekking Poles. Sterling Endurance trekking poles are one of the lightest trekking poles in the market. The poles are made from special T6 alloy of 7075 aluminum. The T6 alloy mixes various types of metals with zinc and magnesium which results in a lightweight, highly durable and solid material as compared to other steels. These poles consist of a feature known as Quick Flip Lock which allows you to adjust the height of the poles between 44inch to 54inch. These poles are suitable for people having a height between 5.4inch to 6.4inch. The weight of these poles is around 10.8 ounces; hence it provides less fatigue and high durability. These poles have far more strength than you could expect. Moreover, these poles open in a different way as compared to the other hiking poles. These are unfolded with shock cords inside like those in the modern tents instead of telescoping like tripod legs. The aluminum 7075 is particularly treated to resist corrosion and the contoured handles offer a great grip. These poles are suitable for any kind activities such as hiking, exercising, backpacking, snowshoeing, walking, etc. Anyone who is on a tight budget or who is just beginning his/her hiking journey can surely purchase Kelty Upslope 2.0 trekking poles. At just $40, these are one of the best trekking poles available in the market. The poles feature rubber tips for pavement walking and extended foam grips which you will require for uphill travel. The poles are built from durable and light aluminum; these three section poles can be twisted into original position and also can be extended from 25inch to 53.3inch. As they are lightweight, they are easy to handle and comfortable. An appropriate EVA foam grip and padded wrist wrap increase stability and comfort and carbide tips offer anti-shock support and more durability. The main drawback in these poles is the locking mechanism. As compared to solid level-locking mechanisms used in other poles, it uses twist lock. In easy terrain, these poles should provide enough holding power. While during high terrain and lot of strain, these poles start slipping. One reason is due to user error; it is very easy to overstrain or loosen the locking pieces to a point where they start to fail. Due to this reason, lever lock mechanisms dominate the market in 2019. 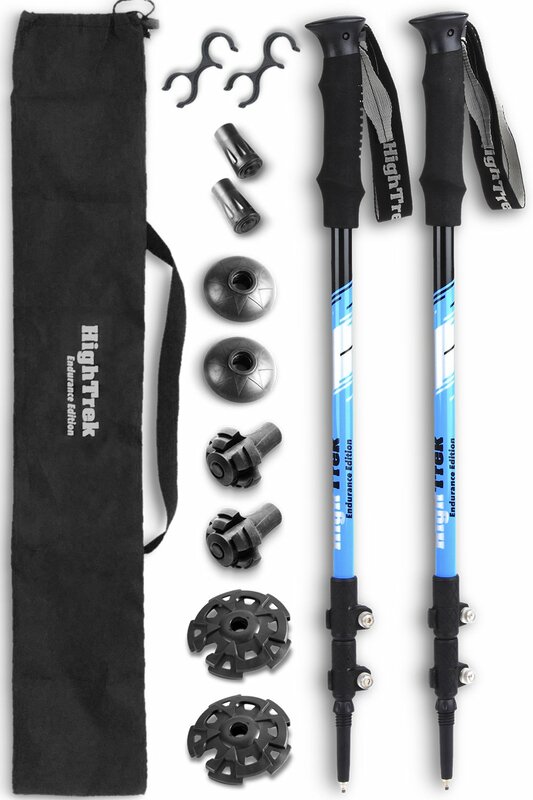 High Trek Premium Ultralight poles are sturdy, stylish, light and inexpensive. 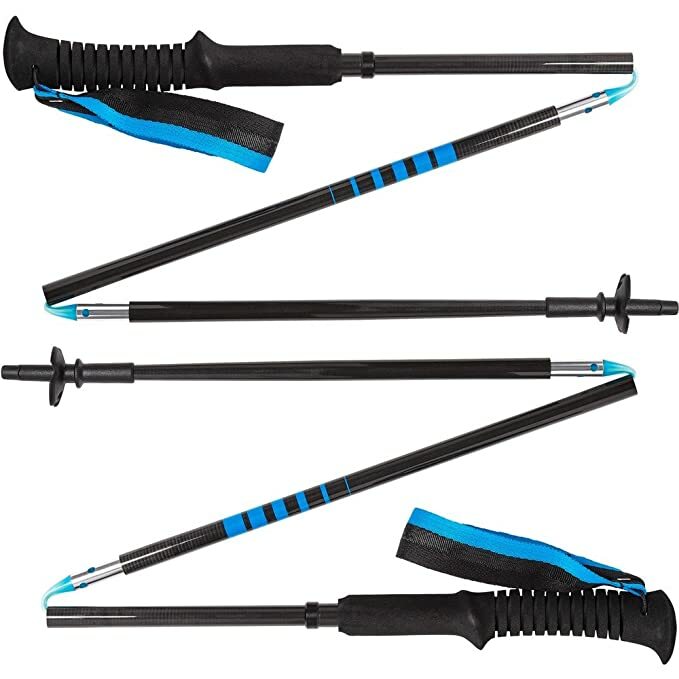 These trekking poles are quick and easy to use due to their simple and effective design. They are built from high quality 7075 aircraft grade aluminum; hence the poles are light and also highly tough. If you partially bent into your hiking poles, then 7075 aluminum is the material you are looking for. These are one of the most attractive trekking poles available in the market. The poles consist of level locks; hence it will be very easy for you to make length adjustments using one hand. They are adjustable from 25inches to 53inches just because of easy flip lock height adjustment mechanism. These poles are suitable for both, short and tall person. The poles consist of tripod-like telescoping legs with folding locks and have generous baskets to resist the tip from sinking more into mud or snow. The package includes monster feet, snow baskets, and a proper carrying bag. Here poles are available with mud baskets and protective covers for the tungsten carbide tips. KevenAnna trekking poles are completely flexible within a 25inches range and are built from solid 7075 aluminum which makes sure to provide great performance and long-term durability. These poles are suitable for various things like trekking, hiking, climbing, mountaineering, and backpacking. Hence, they fall under our list of best-trekking poles 2019. The poles feature extended handles which offer various tactical options than most trekking poles and rubberized tip which offers a great firm plant on the surface. It also consists of anti-shock spring in the core which absorbs contact energy which might otherwise create wear and tear in your joints. This is great for people with weak joints, prevent sports injuries, and it is good for downhill hiking. The poles feature a flexible nylon wrist wraps hence you don’t have to worry about losing a pole in a gap or in a hollow of a boulder field. The trekking poles are suitable for high altitude and cold weather. These poles prevent from corrosion and are free from temperature influence. If you are looking for trekking poles which are highly versatile, then go with Leki Corklite Trekking Poles. The poles consist of Speedlock2 system for more flexibility and a cork grip which is comfortable for long miles. As they are extremely comfortable, the price of these poles is more as compared to other poles in the list. However, this can be neglected as they are available with lifetime warranty. The poles are available in only 1 size, but due to telescopic design, they can be adjusted from 67cm to 135cm and height can be adjusted with one hand while trekking. The optional anti-shock spring is suitable for smooth hiking, and they can also be fitted with snow baskets for more trekking options. Apart from above, the poles feature an air-textured strap which wicks and dries the sweat quickly. Also, it consists of interchangeable baskets which you can tackle in a variety of terrain. 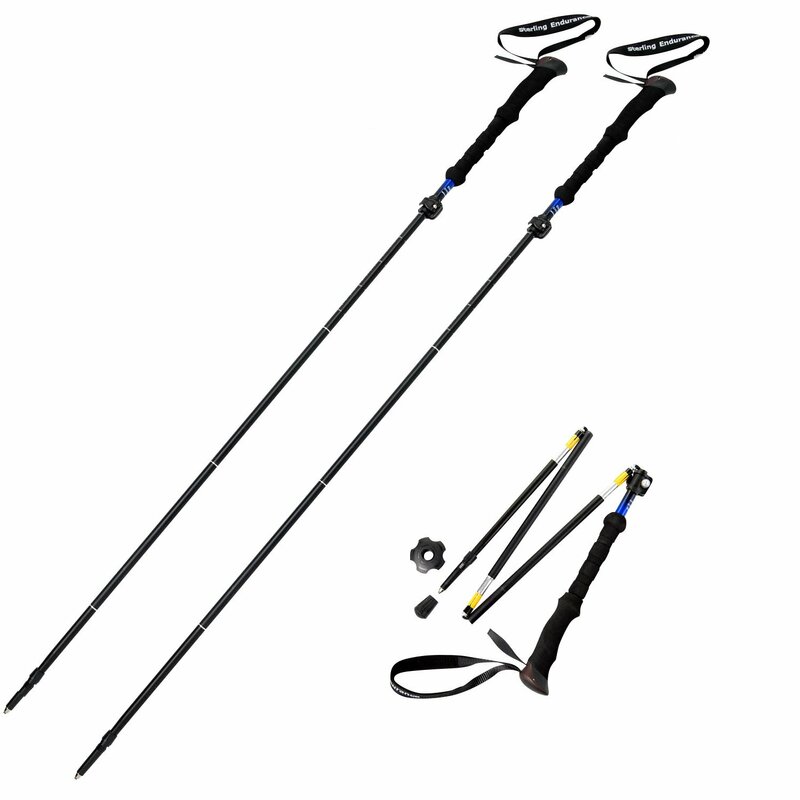 Last but not the least trekking poles on our list are from Denali. The look of these poles matches with walking poles however it is much more than that. The poles are made using high quality 7075 aluminum, hence it is stronger than other poles in the market. Here, each pole telescopes from the bottom, thus allowing you to adjust the height of poles from 26inches to 54inches as per your requirement. The poles can be easily stored in your backpack. Here, each hiking pole is built using anti-shock springs, dampening energy and soothing the impact on your joints. Thus, it allows you to hike more distance than you expect. The poles consist of soft rubber hand grips and durable straps so that you can adjust the grip. If you get a proper grip, then there will be fewer blobs. Lastly, this pole consists of all the features of a heavy-duty pole. Trekking poles price ranges from very cheap (includes thick-steel china made knockoffs) to highly expensive (includes top-shelf carbon fiber and cork). Cost of the trekking poles starts at $25 and goes upto $200 or more. In the above list, we have mentioned different poles. You can purchase anyone as per your budget. Weight of the trekking pole is the second most consideration while selecting the best trekking poles from the list. Just like hiking boots, while lifting your arms a thousand times a day, both the arms matter for saving energy. This thing will not make a difference in the case of short-day hikes, however, it matters a lot in the longer treks. While moving light and fast, the lighter is better, with the caution that the durability decreases as soon as you choose to go with the ultralight category. On the extreme hand, poles such as Black Diamond Distance Carbon Z poles fall into the high-end category. These poles are suitable for ultralight backpackers and experienced hikers, however, the shaft materials are too soft for 4-season use. The two most important materials used to make trekking poles are mainly carbon and aluminum. Carbon fiber poles are lighter; however, they are expensive and might break if not bent properly with force. Aluminum poles are heavier; however, they are more economical and might bend but not break under pressure. Several poles are made with the mixture of both the materials such as the aluminum lower shaft with carbon fiber upper. Durability and weight are two of the most important considerations. Initially, the manufacturers ought to reduce weight by reducing the thickness of the material and the diameter of the pole. A smaller diameter and thinner pole will eventually be less durable and will bend easily as compared to the winder and thicker poles. Secondly, durability is also dependent on the material used to make poles. Carbon fiber poles are lightweight, highly energy efficient, however, they are not durable for a long period of time. Aluminum poles, on the other hand, are heavy, highly durable and can be repaired quickly in the field. You can purchase any type of pole based on your needs and hiking style. Telescoping: Telescoping poles are divided into two or more sections and they are the most basic type of poles available in the market. The poles are popular among the day hikers to backpackers and also mountaineers. The different pole sections extend from each joint using a locking mechanism which can be opened for adjustment and secured while on the trail. These points are also the greatest weaknesses; hence a proper locking mechanism is required. Folding: Z-type trekking poles generally have three sections which fold to roughly 1/3″ of their original length. A wide number of poles come with the tent, you can separate the pieces and pack down into a more compact size. Held together with the internal tension cord, each section unfolds to form a single section shaft when locked into place. Even though when packed down, these poles are small and lightweight as compared to telescoping poles, however, they are not adjustable. Several telescoping poles consist of one telescoping section; hence they will allow you to adjust the length of the pole. Fixed: Fixed-length design is quite uncommon as it is hard to store or transport such as big item. These poles have a trail of fixed length and straight shaft trekking poles. You can’t adjust these poles on uphill and downhill travel. Also, these poles don’t collapse. As they are difficult to store, we don’t suggest this type of poles. When you are not using poles, it is absolutely great to pack down small for storage outside of the luggage or travel. Compatibility is dependent on the number of locking sections which is based on its ability to collapse or telescope into smaller sections. Usually, the Z design pole provides the compatibility along with the smallest collapsed length. Selecting a trekking pole with a proper, confidence-inspiring locking system is difficult sometimes. You don’t want by any instance that your trekking poles fall on you when you need them for balance. However, your life is based on your trekking poles staying locked. Trekking poles mainly have an internal or external locking mechanism in order to hold the pole’s section in place. Internal locking mechanisms consist of a “twist-lock” that increases the small bracket inside the poles when twisted to keep sections on the place. Majority of times twist locks works well. They sometimes have issues when used by an experienced hiker. There are some critical issues linked with using the twist lock system. The twist might get so tight that the lock seizes up and stuck in place until they are rescued using a pair of vice grips. Similarly, when you under tighten the lock, the trekking poles will collapse. External locking mechanisms are referred to as flick locks. Here, a lever is used in order to maintain to build pressure on the shaft and hold both the things in place. Due to external clamp to open or close the pole sections, it is simple to use. Hence, any instance for segments to slip while in lock position is decreased, thus giving more confidence to the user. There are some issues while accidentally opening the lock while moving through heavy brush or sometimes tighten lever with a screwdriver. Grips: The third most important thing which you should consider while selecting the best trekking poles is hand grips. It will be a source of friction against your hands, so uncomfortable grips might lead to sore spots or even blobs. Grips are usually made up of three main types: cork, foam, and rubber. A quality cork handle provides comfortable feel in your hand over time wicks away the sweat easily. The cork material is able to hold more smell. Majority of popular trekking poles consists of cork handles. However, several times they also feature foam grips. Cork grips are highly comfortable and durable. If you don’t like cork grip, then go with the foam grip. EVA foam is soft, gives info about the measure of shock absorption, and also wicks away the moisture in summer quite well. These grips are highly comfortable but not last as long as rubber or cork grips. Rubber grips are usually found in the budget trekking poles. These grips will be useful in cold weather conditions as they protect from rain and snow. However, these grips don’t have a feature of sweat absorption and don’t provide superior feel as in cork or foam grips. Apart from the above three types, plastic grips are available in some low-quality trekking poles under $40. Moving one step ahead in grip materials, one more thing which you can check is whether poles have an ergonomic handle or not. These kinds of grips generally have a slightly forward angle, mainly around 15 degrees. Also, you will be able to know where your hands will rest. Here you should select handle as per your choice and requirement. Currently, Black Diamond’s Ergo models have the best ergonomic handles. Various poles consist of a second, smaller grip below the main one. This grip is referred to as a choke-up extension or extended grip. These primary foam grips are amazing for finding a safe hold lower on your poles when climbing high terrain or side hilling, thus enhancing balance and leverage. For all those people who regularly hike on technical terrain, should have this feature. For DIY lovers, you can simply wrap duct tape before main grips for a secure and comfortable hold. The last thing in the grip construction is the strap. The most essential thing about the straps is how to use them properly. There are a wide number of strap designs available in the market, ranging from heavily padded to nylon. Several hikers ignore the straps as they are not connected with the straps altogether as they might not be connected with the poles. The correct way is that your hand is needed to enter from below before grabbing the grip. This will form a loop beside the back of your hand with two sections of strap moving via your palm. By this, you will be able to put great pressure on the upper body of the pole, without any need of exhausting hand grip. While selecting a strap, you should check if there are any harmful irritants. Here, if they seem to be rubbing against the back of your hand, then it will result in chaffing by taking just a few miles. Generally, most of the poles consist of a good strap. Majority of poles come with the removable baskets which is like a big circular plastic section around the tips. The only purpose is to keep the poles from driving too deep in snowy conditions. You might also feel that the pole baskets are usually unnecessary for hiking unless you are on snowy trails. Pole tips mainly consist of a plastic body which holds a durable point at the end, mainly made up of hardened steel. They are specially made to work efficiently in dirk, rock, and ice to enhance stability and traction. In order to retain optimal functionality, tips are required to be replaced every 1,500-2,000 miles. Shock absorbers are mainly small, spring-like mechanisms around the tips of the poles that decrease the impact of the pole striking the ground. Internal shock absorption systems are usually present in high-end poles and will raise cost and weight. On longer treks, this extra weight will make a difference. There are various good reasons to purchase shock absorbers, however, you have to make a lot of compromises for that. When the poles are properly adjusted, your arms must form a 90-degree bend when they are held with the tips on the ground. It is essential to check whether the poles are set properly and are comfortable, hence you can simple stress your neck, shoulders, and wrists with poles set at a proper height. While moving uphill, you should shorten your poles around 5 to 10cm to offer good planting and traction. With shorter poles, you will be able to keep the momentum on uphill trekking. While moving downhill, increase the length of your poles by 5 to 10cm to keep solid footing and stability. Several brands provide gender-specific poles, hence there is a difference in color, size, and design of the poles. Most of the trekking poles are unisex and work well with both men and women. Go with a pole which suits your requirements. Trekking poles might hurt the trails soil, vegetation, and rocks bordering the trail. High traffic trails after long use in snow melts and rain are vulnerable to snowmelt and rain. Trekking poles are designed as a unisex product, however, there are a lot of models which provide women’s version. The main difference between the women’s trekking poles is shorter diameter grip, meant for smaller hands, and small maximum length. Particularly, anyone who doesn’t want to get the benefit of extra length and want to get the benefit of smaller diameter grips should go with women’s trekking poles. The main benefit is women’s poles have a smaller length, hence they can simply carry in a suitcase for traveling. There are a lot of benefits of using trekking poles while hiking. Trekking poles will decrease the wear and tear on the body in long-time. Hiking and trekking on mountains require a lot of effort and strength. Hence you should take benefit of all the important tools while spending time in the world’s toughest environment. As soon as you know how to use trekking poles, your life becomes better. By asserting a lot of effort, your knees, ankles, feet, hips, and backs will almost wear out. 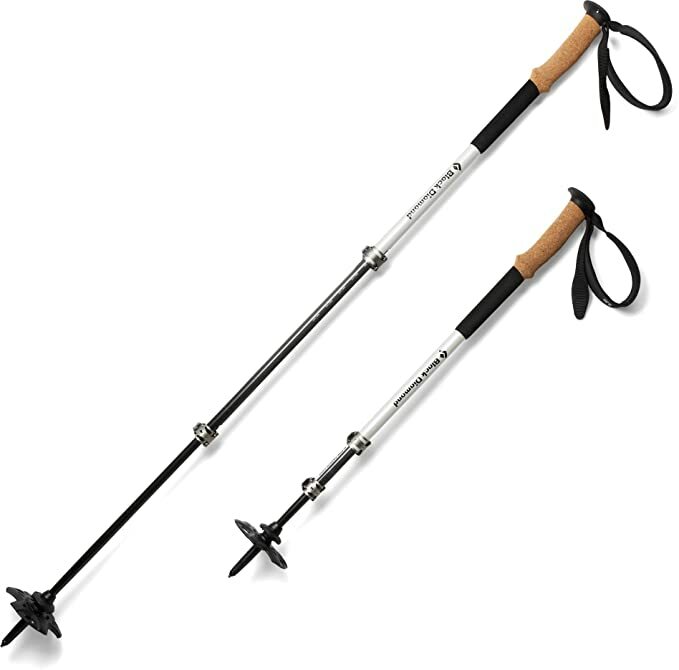 We absolutely believe that trekking poles will increase the life of your body parts. We know that it is difficult to decide the best trekking poles from the above list. Hence, we provided you all the important factors which you should consider before buying trekking poles. You should buy trekking poles by checking the best trekking poles reviews online. You should also purchase it based on your budget and requirement. According to our experience, Black Diamond Alpine Carbon cork is best all-around trekking poles. While Black Diamond’s Women’s Trail pro is best for women. We hope that you are able to select the best trekking poles from the above list. Lastly, don’t forget to share this list with your friends and followers. We have collected Top 20+ Best Trekking Poles 2019 - Reviewed - There are a wide number of trekking poles available in the market.